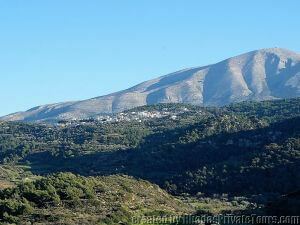 The village of Kritinia, meaning "New Crete", was founded by some families who came as refuges from Crete island. 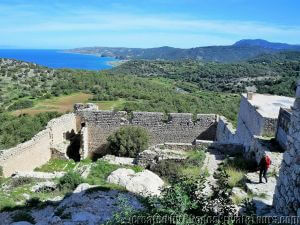 Originally, the settlement was located by the coast, in the current position of Kamiros Skala; but after the Byzantine era it was moved to the hills, for safety against pirates. 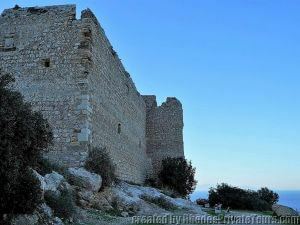 In its heyday, the castle must have been a place of refuge for the inhabitants of nearby villages during enemy raids. 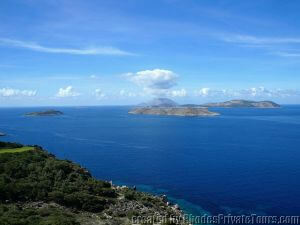 From those hills, you have a panoramic view of the Aegean Sea. 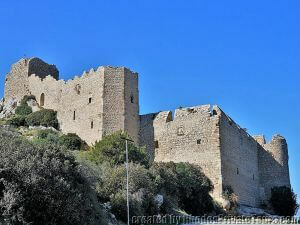 The castle above Kritinia, named Kastellos, was built in 1472 by the engineer Giorgio Orsini to protect the inhabitants of the village from the attacks of the Ottoman fleets. The ancient settlement on the coast eventually sank. 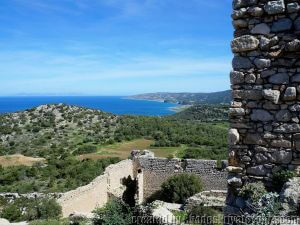 Kritinia village is located on a hillside between Mount Attavyros and the western coast of the island of Rhodes. It is 55 km / 34 miles, southwest of the city of Rhodes. 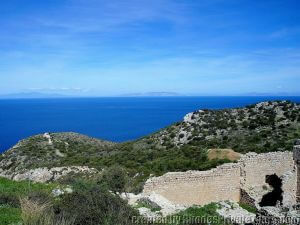 5km from Kritinia, on the edge of the Aegean Sea, is Kamiros Skala, the site of the original settlement. It has a little port with a ferry service to the island of Halki. 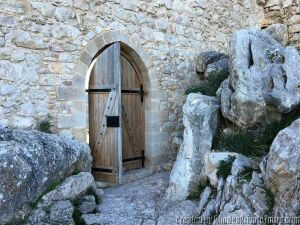 The Knights of the Order of St. John Hospitaller chose this site to build a castle because of its strategic location. Its 360-degree monitoring view of the sea allowed the inhabitants to keep track of the activities of pirates and enemies. 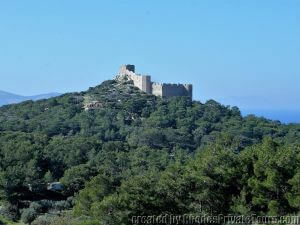 The construction of the castle took place under the rule of four different Grand Masters. 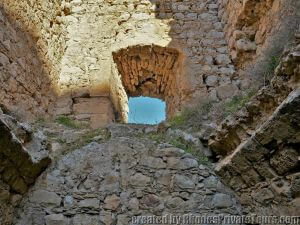 The castle was divided into three levels. It was started in 1472 on the authority of the Grand Master Giovanni Battista degli Orsini (1467-1476). The original engineer was the Venetian sculptor and architect Giorgio Orsini. 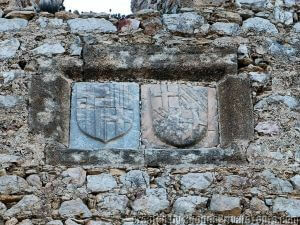 Grand Master Pierre D’ Aubusson (1476-1503) contributed the tower and gunnery. Fortifications specialist Basilio Della Scola (also a great adventurer and mercenary from Vicenza) was in Rhodes between 1520 and 1522, where he was engaged to strengthen the forts. Construction of the castle was finally completed in the 16th century under the Grand Master Fabrizio del Carretto (1513 - 1521). 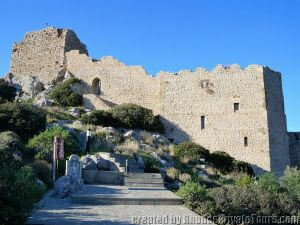 The castle of Kritinia is a mixture of Byzantine and Medieval styles. At an elevation of 110 meters / 360 feet, it is a rectangular building, and the southwest section of which faces the sea and Halki Island. 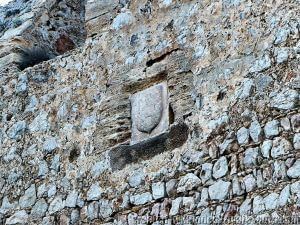 Only the shell of the castle survives today. 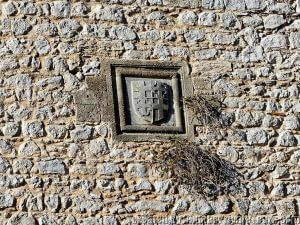 But above the entrance of it, on the left side, lie the coat of arms of the Grand Master Giovanni Battista degli Orsini. 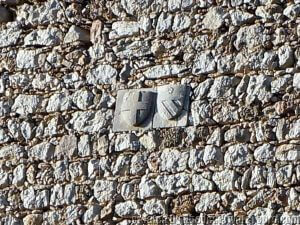 On the right side on the polygonal flanking tower which is containing a gunnery, lie the coat of arms of the famous Grand Master Pierre D’ Aubusson. Because of its strategic location and views of the surrounding areas, it was an important relay station for alarm signals, receiving them from the islands of Chalki, Alimia, Makri, Strongyle, Tragoussa and Symi. 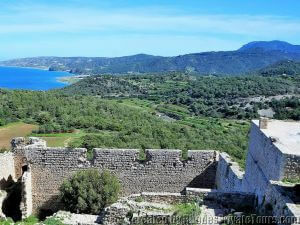 The castle also controlled the coastal road leading south on the west side of Rhodes.